Mr.Vivek Pandit is a consultant at Nashik for the geological investigation of water and is the proprietor of Shripad Consultancy. Site selection for a new bore well or open well, survey with the help of soil resistivity meter, underground pipe leakage detection services, old open well water geological investigation and site determination for rain water harvesting are the kind of services they provide. Mr.Pandit is a mechanical engineer who graduated from Bandra . He started his career in Mumbai as a design engineer designing machinery & installing them at the client site. After marriage, he joined hands with his father-in-law who was into manufacturing of soil resistivity meters and there has been no looking back since then. When was the inception of Shripad consultancy? Shripad Consultancy was formed in 2001 and we have been in this business for the last 18 years. You talk about using something called resistivity meter for selecting the ideal place to dig a borewell. What is a resistivity meter, what does it do? Every substance has the physical property of resistance. Soil resistivity is the measure of resistance offered by the soil to the flow of electricity. The resistivity of the soil depends on the various factors likes soil composition, moisture, temperature, etc. Generally, the soil is not homogenous, and their resistivity varies with depth. So when the probes are inserted into the ground and electric waves are sent to almost 300 feet, we can detect the point at which the soil strata is changing. The classification of soil layer is then done based on the resistivity it exhibits. Using this data we can predict if there is water in that horizontal layer or not. Is the resistivity meter used for other purposes? The resistivity meter can also be used during the construction of buildings. The foundations of buildings should be hard and strong. So we use the same resistivity meter for finding the depth upto which hard rock is present underneath. It can also be used during the construction of dams. When dams are being built, there should not be any cavity beneath it. The presence of a cavity can cause damage when the weight of water exerts pressure. So before building a dam, we have to check if there is any cavity and if at all a cavity is present, till where does it extend. What are the other services that Shripad consultancy offers? Since the last 18 years we have been doing many things like underground pipe leakage detection, old open well water geological investigation and site selection for rain water harvesting etc. But mostly people approach us in order to determine the availability of water. They want to know if water is there for drinking purpose, harvesting, for making borewells etc. We will be able to show them the source of good water. That is the major work we do. You are located at Nasik, where do you get major enquiries from? 70-80% of the enquiries are from Maharashtra. Very few enquiries come from outside Maharashtra. So how does it work? If a person wants to put a bore well, how do you go about it, what are the steps followed? We first have a technical discussion to understand the client requirement. Then we fix a date for the field visit. We ask them to deposit the fee to our bank account before the field visit is conducted. Once the payment is made we make sure we visit the site on the fixed date and time. Due to some reason if we are not able to visit the site, we request for another date or refund the fees. How long does it take to do the testing once you reach the site? There are two methods for testing soil resistivity – the 2 pin method and the 4 pin method. If we reach the farm land of around 4 acres at 9 am and we start our work using the 2 pin method at 9.30 am, by around 3.30 pm we would be able to determine if the percolating line is present in the natural resource or not. If water is present and if the water line is faded, we use the 4 pin method to determine if we can dig a well there. This might require us to work till 6 pm following which we would have to do some documentation work. In total, we might require almost 10 hours for 4 acres. If the land area is more, we would require several days to determine the best place for the bore well. The consultation charges for site selection for a borewell using 2 pin method is Rs.8000 and Rs.10000 for an open or horizontal borewell. The cost of travelling, lodging , boarding etc is also borne by the farmer. 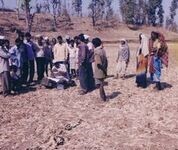 Do you also help in putting up the borewell or is it just the site selection? We can tie up with people who dig borewells, but as we roam all over Maharashtra, it is not possible to bring that resource all the way from Nasik. The next option would be to tie up with the local service providers, but that would turn out to be harmful for the farmer since we may not bhe able to find a reliable service providers to partner with all over the state. What has been your observations over the course of time? What are the changes you have noticed in the last 18 years? The education level has improved. The farmer himself is able to decide whether to do farming there or not. When I started in 2001, I used to go the bus stand and from there I used to go to the farm in an auto rickshaw, bullock cart or bicycle But nowadays its either a 2 wheel or 4 wheeler ..And if it is a 4 wheeler the AC would be ON Now I do not have to bear the hardships that I had to when I started 18 years ago. What is the basis for this testing, is it proper science? There are many methods, there is a science behind that too just like how there is a science behind the way we are communicating with each other now. If there is a cave and there is constant breeze, because of the friction a magnetic field is created and the machine gets activated. As the soil quality may vary greatly with depth and over a wide lateral area, estimation of soil resistivity based on soil classification provide only a rough approximation. Actual resistivity measurements are required to fully qualify the resistivity. So there is some measurement, some basis behind all this. What is the total cost for putting a borewell in Maharashtra? What is the average expense incurred by a farmer? Now as the fuel price has shot up, it would cost around Rs.70 per feet. So it would add up to around 15-20K for the farmer. What is the depth of the borewell nowadays? The machine that we use can go upto 300-350 feet below the surface of the earth, but we detect the presence of water by around 200-250 feet mostly. The rain water percolates into the earth based on the porosity of the soil. Generally the porosity does not allow water to go deeper than that level. Water can be found around 500-700 feet also. But that would be black water. Bore wells came into existence in the 80s, before that it was just wells and ponds. Rainwater was harvested and used. Everything was based on that and that is indeed the best solution.